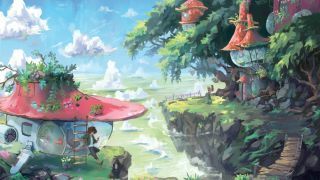 Tips to help you bring your dream worlds to life through your art. Imagined scenes that leave you with a sense of wonder make you want to find out more and see what’s just around the corner. Good world building is all about gathering up enough information for you to discover the story inside a composition, and become immersed in it. When drawing and painting a world, ask yourself how the world functions, the relationships between characters in it, and the overall mood and feel you want to set. This allows you to logically and organically develop the story and design. How does the air taste? What can you hear? How do characters get around? Defining your image with subtle rules gives it some authenticity and life. This piece captures the life of someone living in a quirky cliff-top home that overlooks misty, expansive plains. The environment has a sense of personality, spring freshness, and calm, and a cohesive visual language. Through seeing the thought process behind this image's creation, you'll gain an understanding of how to build stories in your paintings. Gather references that inspire and interest you, to use as a visual anchor to refer back to during the painting process. Also consider the mood and theme of the scene: if you want it to feel fresh and bright, throw down shapes using dawn colours such as periwinkle blue and pale yellow. This part is always a mess, but it’s worth it. Now you have a rough stage, start to tell the story. Working over the top of the thumbnail, consider where you want this world to be set. This scene is high up in the mountains, clouds drifting far below, with a house organically built into trees. To imply the mechanics of daily life here, I added in a couple of delivery aircraft. Work with what gives you the most inspiration. I put in more colour pretty early. Although many people work in greyscale initially, I find it holds my imagination back and leads to fewer happy accidents, so I play around with colour combinations and look for exciting contrasts – like the coral orange of the gestured-in rooftops. Expand and reduce the detail in your image until you find a balance you're happy with. Define the planes of the environment a little more clearly so that it gives your brain the mental breathing room to process – too much information is overwhelming. It'll also enable you to clean up your lighting to get the mood you want. Good world building means the materials and environments should be in keeping with the story you’re trying to tell. I want this place to feel safe and secure even though it’s high up and precarious, so I bring in deep-rooted trees and moss-covered rocks to make this location feel like it’s stable and has been here a long time – and it won’t go anywhere fast. Repeating shape language throughout an image makes it cohesive, so when I create the ship silhouettes, their design is influenced by the shape of the rooftops and greenhouse bubbles. The ships transport plants around in a whimsical way, which will require sunshine and water. I also add details like airbrakes and a rope ladder, for practicality. When rendering I’ll create shapes and then carve into them with textured or square brushes, defining sharp edges that create focal points. I do this especially for grass trims around cliffs, or on craggy rock formations. Because of this I rarely use lots of layers, preferring the organic approach of painting over forms before erasing them. A trick as old as the invention of the mirror, but flipping your image to check its composition is wholly necessary, as it's a great way to pay attention to your little quirks of drawing. I tend to tilt my compositions due to the hand and angle I draw with, and thus the composition can slide off the page. I darken the rocks in the corner and pull the foreground cliff edge up to balance the image. Now it’s time to make this world feel personal, I ask myself how the inhabitants would decorate their treehouse. In my mind they grow mountain flowers for sale, so I dot baskets around outside and fill the ‘bubbles’ with foliage. Those rooftop platforms would experience lots of rain, so I cover them in plants, too. There’s so much beauty to be found in messy details – make use of it. Don’t be afraid to drastically change your composition if it isn’t sitting right. Here, I need something that balances out the bottom left, and the combination of the house and the airship is getting too busy. I use Free Transform to move the ship, and change its colour palette to the white of the clouds and the pink of the roof tiles, which connects it more to the scene. The two ground planes are sitting at the same height, which makes the image dull to look at and doesn’t communicate scale well. I increase the airship size even further and use the Free Transform tools Perspective and Skew to warp the bridge into an angle that implies downward traversal, which then pushes the mid-ground down and back. Adding figures is a universal way to communicate scale to a viewer. I gesture in an airship pilot with a thought to what they’re doing; I want this piece to capture a relaxed moment during a routine morning pickup. When adding someone to a piece, their posture is the most telling thing about their character. I act out this pose to achieve the exact, unhurried vibe I want. I add another figure to provide context as to who lives or works at the treehouse, but also to imply a relationship between the two figures. Raising questions is the best way to pull a viewer into a scene. What is the nature of their relationship? Do they have a history? The over-the-shoulder glance implies a bit of a crush, and that’s a cute detail I can’t resist. As humans we naturally follow the eyeline of other people, so I have a pleasant compositional loop happening through the pathway and the gaze of the figure in the distance. I emphasise that loop by adding airship contrails, which has the added effect of implying there’s a bigger world out there than just these two. That’s always incredibly exciting – just imagine what it could be! This article originally appeared in ImagineFX issue 151. Buy it here.